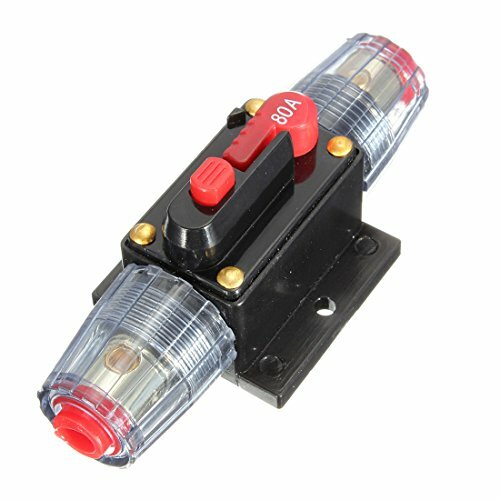 DC 12V/24V/32V Car Stereo Audio Circuit Breaker Inline Fuse Holder (80A) by QUhang at Buy Car Now. MPN: QUhang. Hurry! Limited time offer. Offer valid only while supplies last. Specifications: Accepts 8 / 10 / 12 AWG Works with 12v/24v/32v DC battery 4mm in diameter input and output Ideal for car, marine, bost, bike, etc. Ideal for car, marine, bost, bike, etc. Stops power surges from damaging your amps. Unique Push Button Reset can also be used as a kill switch. Function: prevent excessive current, protect the electrical appliance. Apply in connecting audio power line. Use in place of an inline fuse holder. If you have any questions about this product by QUhang, contact us by completing and submitting the form below. If you are looking for a specif part number, please include it with your message.